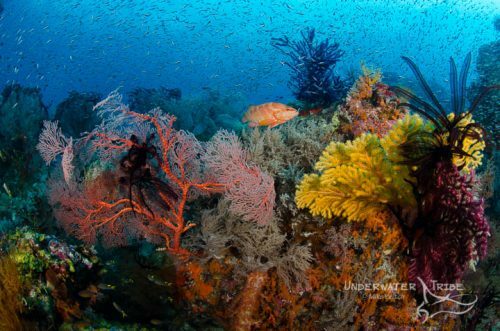 Rated at # 1 of our “Top 5 Dive Sites in Raja Ampat” is the wonderful Magic Mountain (aka Shadow Reef) Located in the far south of Raja Ampat in the Misool region, Magic Mountain is an offshore pinnacle that offers non-stop action all day long. When the current is running jump in and head straight down the sloping reef to watch schools of barracuda, fusiliers, and surgeonfish playing in the current. Up in the shallows large groups of jacks and trevally pounce on unsuspecting prey while large napoleon wrasse swoop in for scraps. On the western edge of the pinnacle lies a long peninsula that is covered in seafans and soft corals and is often patrolled by white tip and grey reef sharks cruising in the upwelling from the deep. At the end of the peninsula is a cleaning station where oceanic manta rays come to be cleaned of parasites by wrasse and other reef fish. As bottom time starts to wane it’s time to head back to the shallows where another manta cleaning station provides an incredible safety stop for lucky divers. If no mantas are in attendance at the shallow cleaning station there is no lack of other entertainment with a large school of yellow snapper, batfish, white tip sharks, large grouper, and the occasional wobbegong shark preside. 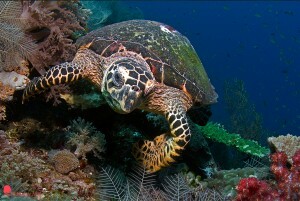 Rated at number 2 on our “Top 5 Dive Sites in Raja Ampat” is the aptly named Four Kings. Located to the east of the island of Pele in southern Misool, Four Kings is a series of smaller submerged pinnacles in the middle of nowhere. The site itself is shaped similar to an underwater mountain range as a long ridge connects the tops of a series of summits below the surface. 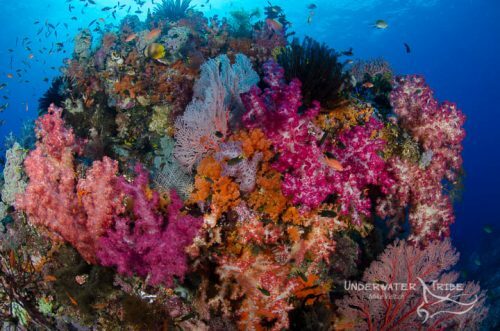 Every surface is covered in beautifully coloured soft corals and sea fans with innumerable fish swimming close to the reef. 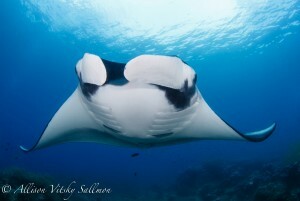 Lucky divers often encounter pelagic mantas using the shallow plateaus as a cleaning station when the current is not too strong. Turtles, pygmy seahorses, long nose hawkfish, resident schools of bigeye jacks and barracuda are just a short list of the incredible amount of marine life that calls this dive site home. 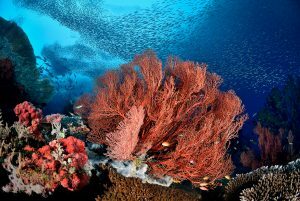 Coming in at #4 on our list of “Top 5 Dive Sites in Raja Ampat” is Blue Magic. 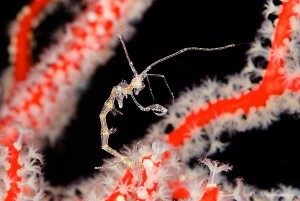 One of the more popular dives in the Dampier Strait, Blue Magic is on this list because it most definitely lives up to its reputation as a top site. Although it’s a small pinnacle, this has no bearing on how much action can be seen at this site. Starting at 7 metres depth and dropping off to a sloping sandy bottom at 30 metres, Blue Magic is famous for large population of fish. 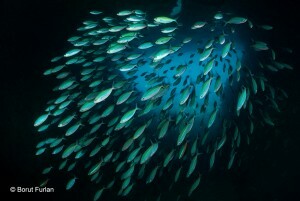 Schooling yellow tail and chevron barracuda, a large school of horse eyed jacks, bright red big-eyes, and even a resident population of Spanish mackerel make this site one of the fishiest in Raja Ampat. 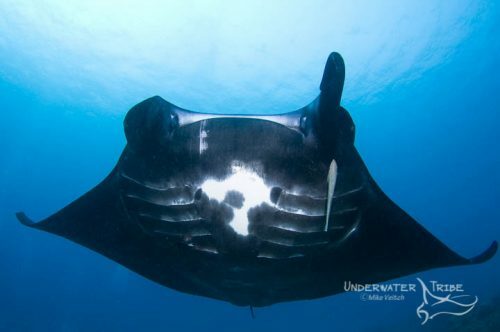 Of course it’s not just the schools of fish that make this site special, it’s here where Oceanic mantas are often sighted, these are the largest species of manta ray. These giant rays, often measuring 5 metres from wing tip to wing tip, appear out of the depths and converge atop the pinnacle to be cleaned of parasites from small wrasse and other fish. The opportunity to watch these graceful giants is at the top of many divers wish list and an incredible encounter for anyone. 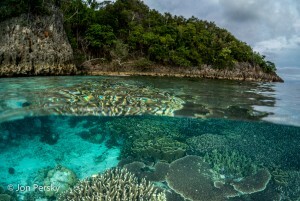 Site #5 on our list of “Top 5 Dive Sites in Raja Ampat” was a hard choice and many may deem controversial as well, we present Mayhem. 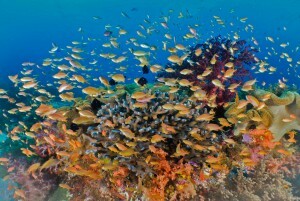 A large submerged pinnacle, Mayhem lies along the western edge of the Dampier Strait just offshore from the island of Gam. The best time to dive this site is when there is a little current running in order to bring the large schools of fish together at the edge of the reef. Do be aware though, this site can have very strong currents, which aren’t recommended for a fun dive, time the entry accordingly. 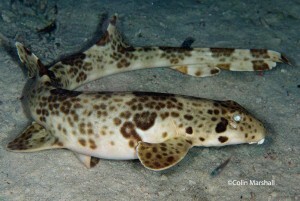 This site has a great variety of encounters, from large schools of fusiliers, snappers, jacks and batfish to wobbegongs and pygmy seahorses on the bottom. 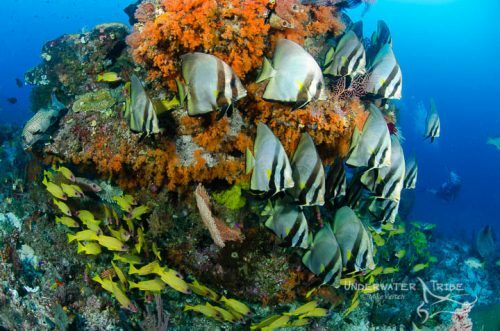 The ideal dive on Mayhem involves dropping in along the edge of the pinnacle along the current side and watching the schools of fish parading in the current. 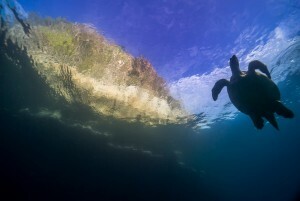 As bottom time slips away, then it’s time to swim along the plentiful large bommies leading toward the shallows. These bommies are often covered in colourful corals and some often feature large schools of sweepers filling up small caverns. 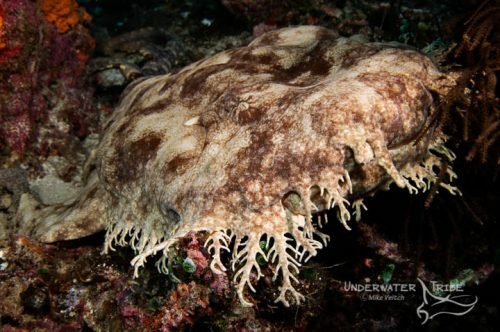 Finding a bommie covered in sweepers is a great find, but at Mayhem, these often come with a resident wobbegong shark sitting underneath, a fantastic opportunity for photographers. 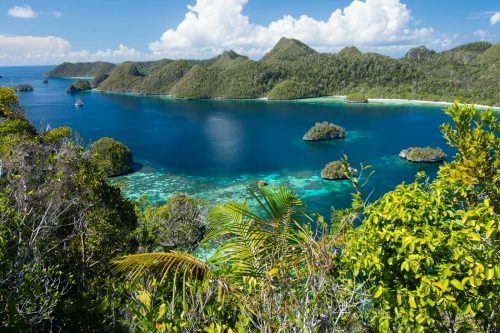 Keep this list in mind when you plan a trip to dive in Raja Ampat, feel free to share your favourites in the comments. Mike Veitch is the co-founder of the Underwater Tribe, Bali’s leading dive centre specializing in teaching underwater photography and creating custom itineraries for serious photographers in Bali and throughout Indonesia.